Textured nails have been a hit for me. They wear really well & I am loving having something a bit different. Sometimes you just need to switch it up! 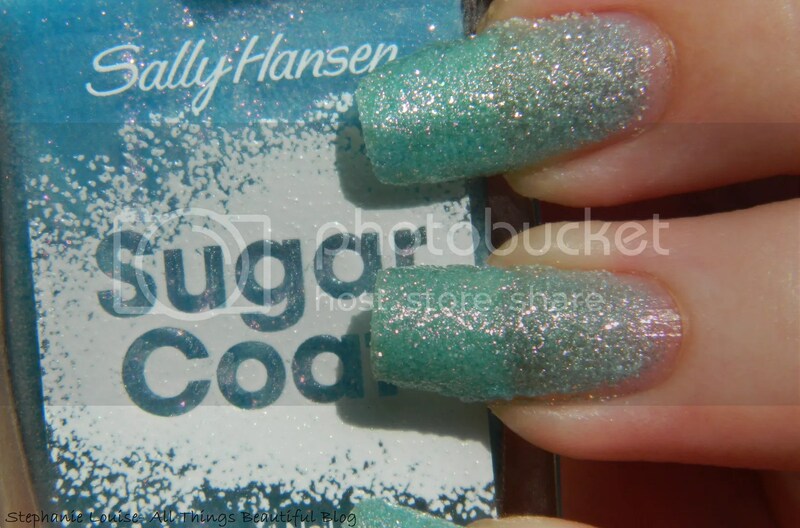 Sally Hansen Sugar Coat nail polishes have been a fun way to dive into this trend. If you caught Part 1 ( check out these pastel/springy shades!) & Part 2 (primary & basic shades!) then you noticed none of them had any shimmer. Today I fix that! I picked up two containing shimmer (like OPI Liquid Sands or Zoya Pixie Dusts which I also reviewed) & then two original shades without shimmer. I finally found a gorgeous purple, stunning teal, & two unique shimmers. Keep reading for the breakdown! I applied 2 coats of each shade, no top coat for each shade except Royal icing which required more. Sally Hansen Sugar Coat Nail Polish in Royal Icing- Sheer light blue with fine pink/gold shimmer. This is a pretty sheer shade, this is 3 coats. I will definitely use a base next time. This is the sheer, textured version of Sinful Colors Cinderella. Much more impressive in person. 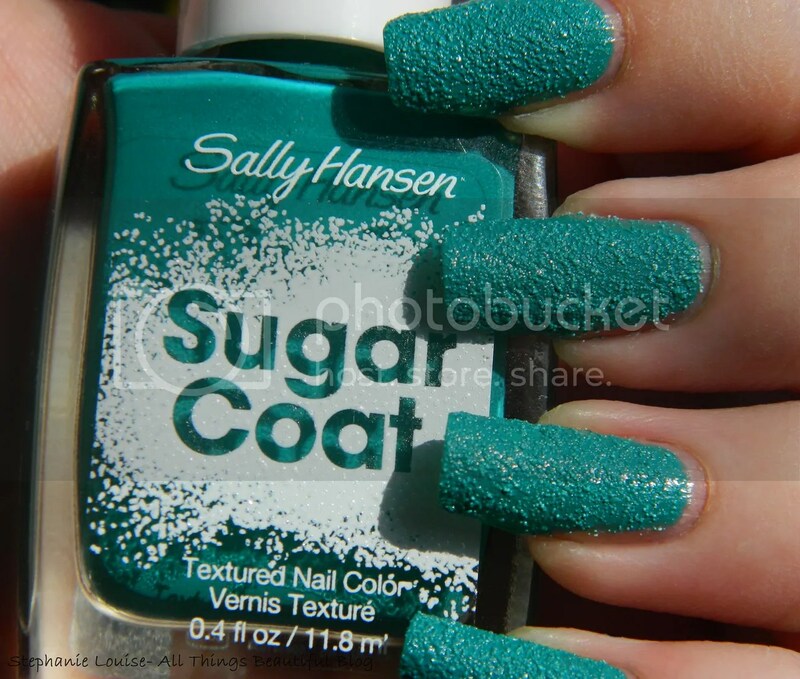 Sally Hansen Sugar Coat Nail Polish in Spare-A-Mint?- A perfect teal. I feel like this one has a really nice texture & was pretty opaque! You might be able to get away with one coat but 2 thin ones lends better texture. 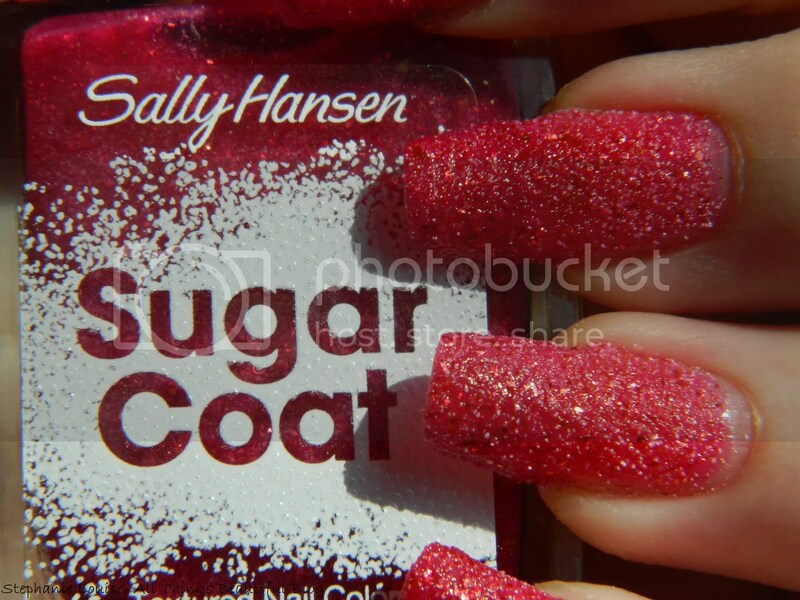 Sally Hansen Sugar Coat Nail Polish in Pink Sprinkle- A cranberry jelly type base with irregular glitters that look gold & copper/light bronze. I love this one, such a gorgeous combo for fall! Sally Hansen Sugar Coat Nail Polish in Gummy Grape- A medium grape purple with cooler tones than most of my other purples. I’m really happy with the 4 shades I picked up from this new collection! I found mine at Walgreens on a specialty display. As far as I know these are all limited edition so if you want them, you’ll have to snap them up! What do you think of these shades? Do you prefer textured polishes with shimmer or without? 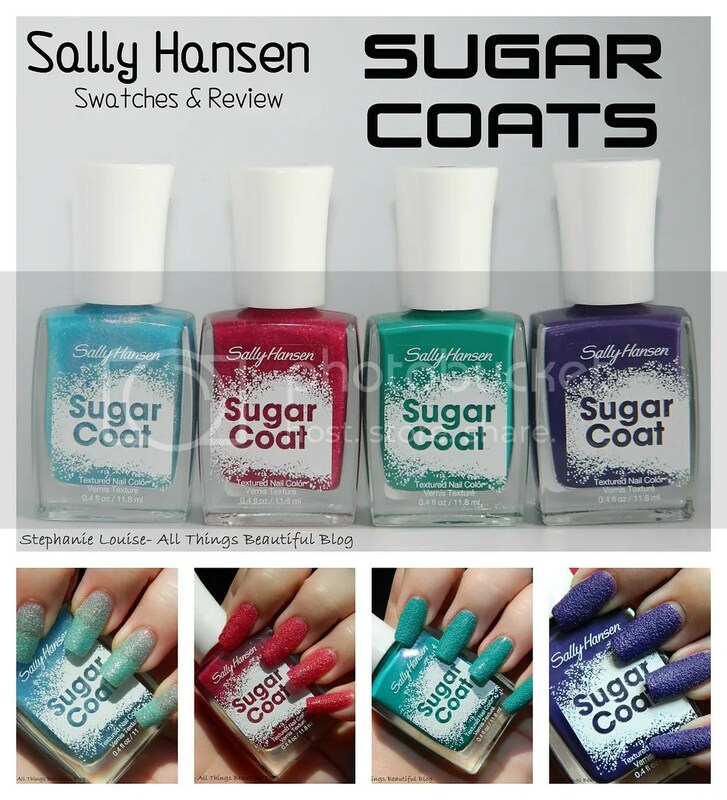 Sally Hansen Sugar Coat Nail Polish Swatches + Review Part #1 Sally Hansen Sugar Coat Nail Polish Swatches + Review Part #2 Sally Hansen Color Frenzy Nail Polish in Red, White, & Hue Swatches & Review Sally Hansen Lustre Shine in Copperhead Swatches + Review!